To make sure you don’t walk into the Securities Industry Essentials (SIE) exam testing center, take one look at the computer screen, go into shock, and start drooling on the keyboard, this article covers some of the testing details for the SIE exam. The SIE exam is a computerized, closed book (in other words, no book), one-hour and 45-minute exam. The exam consists of 85 multiple-choice questions (although only 75 of them count toward your score — see the next section). You can take bathroom breaks at any time, but the clock continues to tick away, so you may want to reconsider drinking a mega-jumbo iced latte in the morning before you arrive at the exam center. To ensure that new questions to be introduced in future exams meet acceptable standards prior to inclusion, you answer 10 additional, unidentified questions that don’t count toward your score. In other words, you get 85 questions to answer, but only 75 are scored. Note: If you see a question on the SIE that doesn’t seem even remotely similar to anything that you’ve studied (or even heard about), it may very likely be an experimental question. Although you don’t need any previous computer experience to do well on the exam, you don’t want your first encounter with a computerized exam to be on the date of the SIE exam. Being familiar with the way the questions and answer choices will appear on the screen is essential. The following figure can help you prepare for exam day. 2006 National Association of Securities Dealers, Inc. Reprinted with permission from NASD (now known as FINRA). 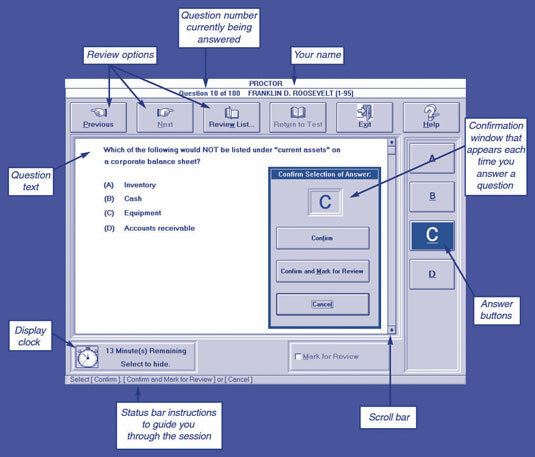 The PROCTOR computer system lets you select answers and mark them for review. A friendly exam-center employee will give you an introductory lesson to familiarize you with how to operate the computer before the exam session begins. Although the computer randomly selects the specific questions from each category, the operating system tracks the difficulty of each question and controls the selection criteria to ensure that your exam isn’t ridiculously easier or harder than anyone else’s. You can mark answers for review or change responses only for the part of the test you’re currently taking. In other words, after you begin the second part, you can’t go back and change answers from the first part. Although you can review and change all your answers at the end of your test, don’t. Your brain is going to feel like it went through a blender by the time you get there. Review only your marked questions and change the answers only if you’re 100 percent sure that you made a mistake. As an instructor, I know that people change a right answer to a wrong one five times more often than they change a wrong one to a right one. Remember having to wait weeks for a standardized test score, hovering somewhere between eagerness and dread? Those days are gone. At the end of the SIE exam, the system calculates your score and displays a grade result on the computer screen. Although the wait for your grade to pop up may feel like an eternity, it really takes only a few seconds to see your grade. When you sign out, the test center administrator will tackle you (well, approach you) and give you a printed exam report with your grade and the diagnostic score results with your performance in the specific topics tested on your exam. Each question on the SIE exam is worth an average of 11⁄3 points (some are worth more and some are worth less depending on the FINRA’s feeling of how difficult a question is), and candidates need a score of 70 or better to achieve a passing grade. This percentage translates to 53 questions out of 75 that you have to answer correctly. The scores are rounded down, so a grade of 69.33 is scored as 69 on the SIE. When I took the Series 7 exam, back when the passing grade was 70, one of the other students from my class got a 69.6 (which was rounded down to a 69), and he had the NASD (now called the FINRA) review his exam to try and get him the extra point. Needless to say, FINRA ruled against him and he had to take the exam again. After you pass the SIE, Series 7, Series 63, and/or Series 66 exam, the FINRA will provide confirmation that you passed. At that point, you can now find a broker-dealer, bank, insurance company, or the like who wants you. Once you’re hired, your employer will let you know which other exams you have to take and schedule them accordingly. To continue working in the securities field, you’ll need to fulfill the FINRA’s continuing education requirements. Within 120 days after your second anniversary, and every three years thereafter, you have to take a computer-based exam covering regulatory elements such as compliance, regulatory, ethical, and sales practice standards at the Prometric exam center. In addition, there is a requirement (called a brokerage firm element) that requires broker-dealers to keep their registered representatives updated on job and product-related topics. The SIE is a relatively difficult exam, and certainly some people need a do-over. If you fail the SIE, you’ll have to request a new test date and pay to retake the test. You should reapply immediately, though you have to schedule the new test date for at least 30 days after the day you failed (that’s 30 days of prime studying time!). If you fail the exam three times, you’re required to wait six months before you can retake the exam. Lack of preparation: You have to follow, and stick to, a well-constructed plan of study. You have your diagnostic printout after you take the exam, and you can use that to focus on the areas of study where you fell short. Prep courses can help you identify and focus on the most commonly tested topics and provide valuable tips for mastering difficult math problems. Also consider tutoring sessions tailored to accommodate your busy schedule and pinpoint the areas of study where you need the most help. Nerves won out: Some people are just very nervous test takers, and they need to go through the process to get comfortable in unfamiliar situations. Next time around, they know what to expect and pass with flying colors. The people who are the most nervous about taking the exam tend to be the ones who haven’t prepared properly. Make sure that you’re passing practice exams on a consistent basis with grades in at least the high 70s before you attempt to take the real exam. Insufficient practice exams: You need to take enough practice exams before you take the real test. I think getting used to the question formats and figuring out how to work through them is as important as learning the material to begin with.